I tried the Madeira inspired bread wrapped in cabbage leaves posted on the blog. i decided to use the pugliese from my book. the cabbage leaves started to burn after about 20 minutes so at that point i removed them. they had already made their lovely imprint on the crust which turned a beautiful golden brown. the bread was 2-1/2 inches high rather than the usual 3 inches and had smaller holes due to the absence of steam ( i decided to rely entirely on the moisture of the cabbage leaves). but it was worth the change in texture for the lovely flavor and here's what i did with the bread: i cut the middle section into 4 slices and froze them. 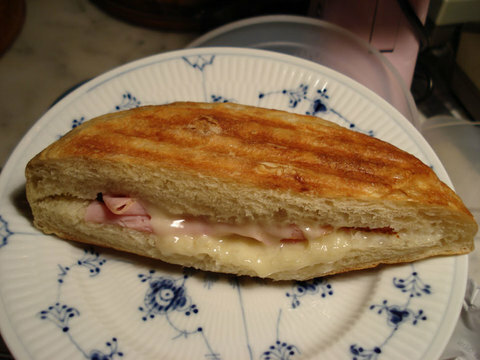 i made a pocket in each end and stuffed it with ham and swiss cheese and grilled it in my cuisinarts "griddler"panini maker. WHAT A DINNER!!! the crust was thin and crisp, the crumb spongy and flavorful. have i ever had a better sandwich!!! the basic technique with the cabbage leaves is to use the outer leaves and place them in the oven to soften and become flexible for 3-4 minutes. 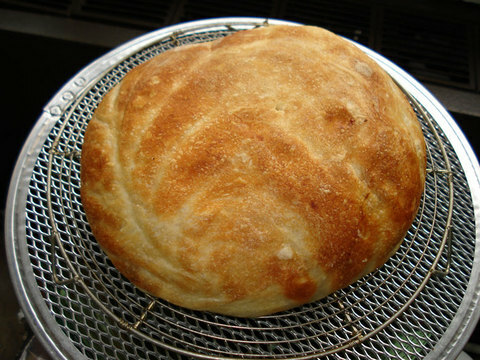 then use one or two large leaves on which to set the shaped risen bread dough and another one or two on top--be sure to spray the leaves with cooking spray to keep them from sticking to the bread. check the baking bread after 20 minutes and if the cabbage leaves are getting very dark remove them and continue baking the bread until done.